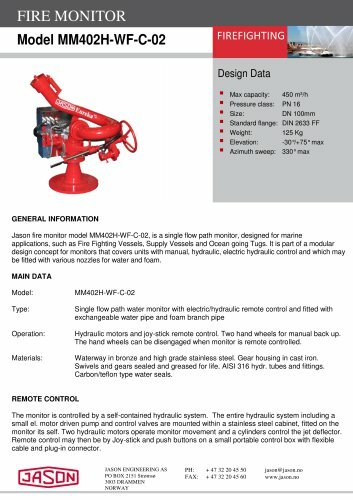 Design Data ■ ■ ■ ■ ■ ■ ■ Max capacity: Pressure class: Size: Standard flange: Weight: Elevation: Azimuth sweep: GENERAL INFORMATION Jason fire monitor model MM402H-WF-C-02, is a single flow path monitor, designed for marine applications, such as Fire Fighting Vessels, Supply Vessels and Ocean going Tugs. It is part of a modular design concept for monitors that covers units with manual, hydraulic, electric hydraulic control and which may be fitted w ith various nozzles for water and foam. Single flow path water monitor with electric/hydraulic remote control and fitted with exchangeable water pipe and foam branch pipe Operation : Hydraulic motors and joy-stick remote control. Two hand wheels for manual back up. The hand wheels can be disengaged when monitor is remote controlled. Materials: Waterway in bronze and high grade stainless steel. Gear housing in cast iron. Swivels and gears sealed and greased for life. AISI 316 hydr. tubes and fittings. Carbon/teflon type water seals. REMOTE CONTROL The monitor is controlled by a self-contained hydraulic system. The entire hydraulic system including a small el. motor driven pump and control valves are mounted within a stainless steel cabinet, fitted on the monitor its self. Two hydraulic motors operate monitor movement and a cylinders control the jet deflector. Remote control may then be by Joy-stick and push buttons on a small portable control box with flexible cable and plug-in connector.